Do you know your road safety rules? Here are some important rules that everybody should follow. Always cross the road at pedestrian crossings, overhead bridges, underpasses or zebra crossings. Always be alert for inattentive drivers even at signalised crossings. Always use footpaths when possible. 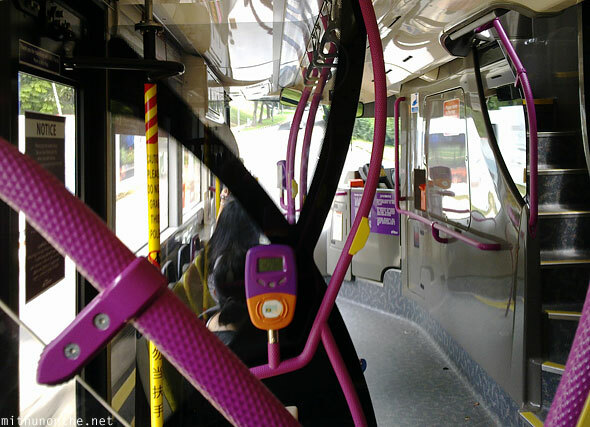 Always hold on to handrails on the bus and MRT train to avoid being thrown off balance during sudden swerves or brakes. Always wait for the bus or MRT train to stop fully before boarding or alighting. Always be alert for any oncoming cyclists or pedestrians when alighting from the bus. Handrails inside a double-deck bus. Never cross in front of a stationary vehicle or between stationary vehicles. Never cross when the “red man” lights up or when the “green man” is flashing. Never play nor stand in the bus bay. Never stick out any part of your body when you’re in a bus or in a car. Never play in a moving vehicle.